After I posted “Putting the Cart Before the Horse?” on Friday, I know many people chuckled (might have been you), raised their eyebrows (might have also been you), and even called me crazy (still you?). I also know many think I am not being logical and living in “la la” land where there are unicorns and fairies. 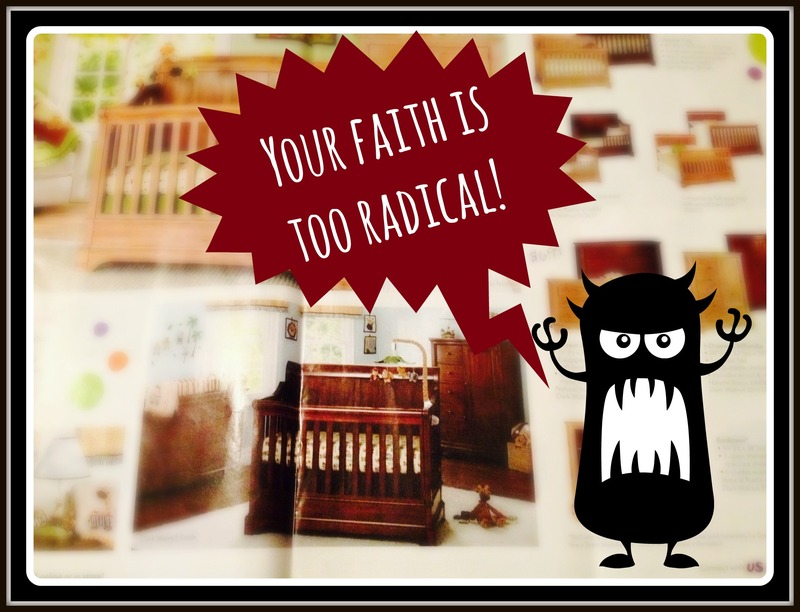 Some people even told me that my faith is too “radical” and I am being recklessly optimistic by ridiculously preparing a nursery. That’s okay. I get it and there are no hard feelings. Quite honestly, I expected it from some, but to hear it from a few others shocked me as I often listen to those same people echo, “God can do all things” and “I believe God is the same yesterday, today and forever” but I have to wonder, do they? Or do they only believe God can do all things as long as it stays in the realm of possibility based upon statistics, past experiences, opinions of others, or scientific research? When I say that I believe God is the same yesterday, today and forever, it means I have faith that the same God who defied all logic and parted the Red Sea, healed the blind man with just mud and spit, and raised the dead with just His words, is still willing and able to do miracles today. What about you? Do you believe that God is willing and able to open your barren womb supernaturally just as He did for Sarah, Hannah, Rebekah, Rachel, and Elizabeth? Do you believe He is willing and able to heal you completely and without hesitation like He did the blind man, leper, and paralytic in the New Testament? Do you believe He is still more than willing and able to separate a body of water for you just as He did for Moses? Do you believe that for you He would stop rain from falling for three and a half years like He did for Elijah? Do you think He can bring back a member of your family from the dead just as He did for Mary and Martha? Think about it. Do you truly believe God is the same and will do the impossible for YOU? I believe that as Christians we need to have the type of faith that believes God for radical things. We need to put actions behind our words by not only saying God can do all things and that He is the same yesterday and today, but also act upon our beliefs. This is the reason I have started preparing a nursery–it’s crazy and ridiculous to many, possibly even you, but I’m wholeheartedly and without wavering, believing God for the impossible. I want my actions to speak louder than my words. The worst possible scenario is that by me putting the cart before the horse, I would be wasting several hundreds of dollars. To me, that’s worth it. James 2:17 says, faith by itself if not accompanied by action is dead. It’s basically pointless. Maybe you want your actions to line up with your words but you are uncomfortable or afraid to be this radical. I understand these thoughts and feelings because I will be the first to admit that it’s not always easy to have this kind of faith. Our logical mindset always wants to kick in and tell us why it is of no use or the situation seems too impossible. Not to mention, others will call you a fool, or tell you to pack your bags for the psych ward because you believe in such impossible feats. However, you can’t let these thoughts and opinions of others rob you of the miracle you need because faith isn’t based on logic and miracles do not come to those who believe in the norm. They come to those who are willing to risk it all by asking and actively believing God for crazy-radical-just doesn’t make sense kinds of things. I encourage you to not be afraid to stretch your faith and get radical because if God can separate a body of water, turn water into wine, and heal a woman who suffered with an issue of blood for 12 years despite medical treatment, then how much more are you (being His child) able to ask God for impossible things and He will do it? Thanks girlie! I was actually hesitant about “publishing” this post. Not sure why because I don’t mind being bold. Maybe the enemy doesn’t want others to actively believe God for a miracle? Thanks for the awesome support and encouragement Meredith! I hope you are having a great hump day! I believe, in Jesus name and by His blood, not only have you been healed but you WILL have a baby from your womb!! Girl there are way too many things that have happened in my life that only God can be given the credit for so I’m with you on this!! Preach it girl! Guilty over here for not having steadfast faith at all times, but just like you, I WHOLLY believe that 1) We will be fruitful and 2) None will miscarry or be barren (Ex 23:25-26), All our needs will be met. Read it, receive it, accept it, claim it. I know I already sent you a picture of the start of our nursery in preparation of the little one God said was on her way! I am inspired by your faith and applaud you for being so brave. I believe in God’s promises – to never forsake us, to give us everything we need, to always love us, etc., etc. 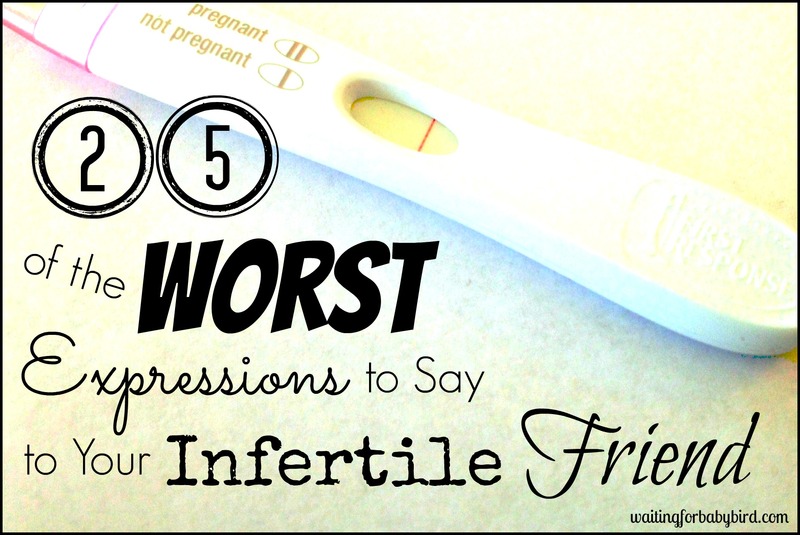 My personal struggle is that I am not sure that God has promised us a baby. We have 8 embryos (left now) and I keep telling myself “God wouldn’t give us so many if He didn’t intend for at least 1 to become a baby”. But, I’m not sure if that’s my own wishful thinking or if our embabies really are a promise from God to give us a child. I know you have had a divine revelation of a child promised by God. I just wish I KNEW we had the same. So, anyway, that’s my struggle with taking the outward steps to show my inward faith. Right now, I am still praying for God to show me the plan He has for us and if it includes a child of our own. Thank you so much for you insight! I totally understand your thoughts and feelings. I always like to tell people that even if He hadn’t told me about a child, I would still believe that a child is His will and in His for me. Furthermore, I also believe that a child is His will for all who have that desire. I believe this strongly because that is exactly how He created us…to be able to create other humans and His plans for mankind hasn’t changed. If we can’t conceive, then there is a healing that takes place which then goes into the promises written in the Bible that healing of ALL forms of sickness and disease is for everyone who believes. If your body is working properly, then you should get pregnant easily. That’s why women who don’t have issues in their body can get pregnant at the drop of a hat. His intention was that if you want kiddos, then do the “deed.” So seek God for healing. He won’t withhold something that He has already paid the price for with His Son. Furthermore, I hold onto these verses because they were promised to Abraham and all of his descendents (us). I hope this helps 🙂 Also, check out the book “God’s Plan for Pregnancy” by Nerida Walker. Powerful book. I have some of her short videos under “Resources” at the top of my page. Thank you for this response! I will have to check out that book. I know I am going on a faith journey through all of this, and that is probably part of God’s plan. I think sometimes our circumstances (male infertiltiy – nothing “wrong” with me) causes me to question God’s plan for children in our life. There’s a lot in the Bible about barren women but not so much the guys. But, He has given us a way (IVF) and He has given us 8 embabies. So, I will hold on to the hope they give us. Thanks again! Oh you will love the book! Her husband was diagnosed sterile by four different tests but supernaturally she had four children in less than five years! One was a set of twin! I can mail you a copy of the book if you wanna email me your addreas. Also hold onto deut 7:14. It says no woman or man will be childless. I am praying and recieving healing on behalf of your hubby right now. I think that the core of my beliefs is–God made us all different, and we all have our own unique path to follow. That extends to how we grow our families. Do you have any theme ideas for your nursery? BTW: I commented on your post but your house is GORGEOUS! Jelly! Wow, wow, wow. This is a good word, a true word and a word in season. We don’t receive because we don’t ask…or we ask but don’t believe. And frankly, I’m tired of living a ho-hum kind of faith. God wants to bless us with SO MUCH — we just often miss out on receiving it! I’ve been planning our nursery as well. It’s important to put movement to faith for sure. Thanks for being so transparent with your faith and struggles. It blesses all of us. This post mad me want to shout hallelujah!! Thank you for being honest Elisha and reminding us of who are faith should be in and his history with other believers. We serve a big God who doesn’t waver at things that seem impossible and neither should we!! Yes and Amen!!! SO thankful for God’s promises to us all throughout scripture and friends like you to walk the journey with! Love that we both posted about having faith for miracles today!!! Thanks for being so encouraging and remind me and everyone else of the truth of God’s word!! I’d swear you read the letter I just sent you, except that I just put it in the mailbox today. 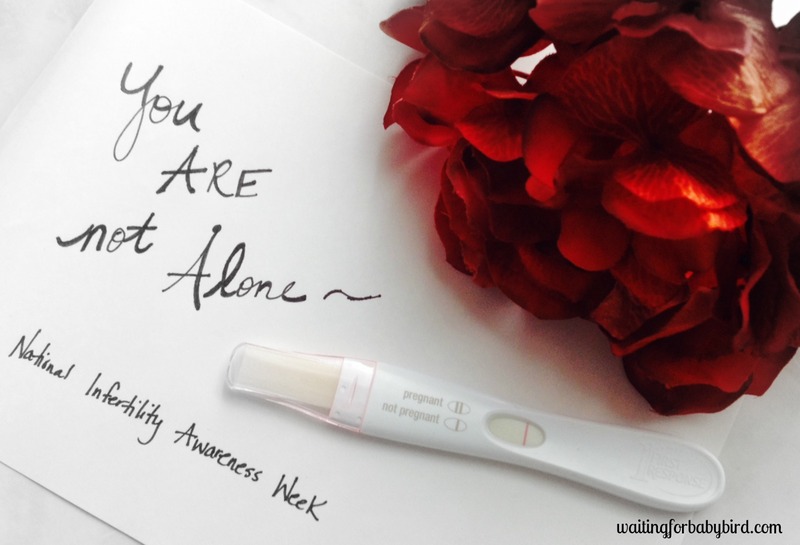 When you read it, you’ll know how fitting this blog was today. Like Wifey, I too, do not know if what I feel is God’s promise or my own desires. Your response to her was everything I needed to hear. Thank you for your never ending inspiration and radical faith. Fantastic post. You are so inspiring. I want to have that kind of radical faith. Follow in obedience in what God is leading you to do. For He knows His plans for you and it sure sounds as if He’s telling you to get ready!!! Thanks girlie! I know this isn’t one of those posts that will get lots of comments, likes or rave reviews but I just felt the need to put it out there. The world says to believe it only after you see it, but God doesn’t work like the world. He says to believe it and then you will see it. Beautifully written. For starters i don’t think you have radical faith. It’s amazing actually. I admire your faith and one thing is through this journey my faith has grown quite a bit. DH and i discused prepping our nursery as well. I’m so glad you chose to “publish”! It’s great that you had the courage to do so because it will help so many. There unfortunately are a whole lot of so called christians out there they say they believe God is a god of miracles and they believe he can heal. But in all reality they don’t if illness hits there family or a financial struggle they ask where is God. I love that you are radical in your faith. You remind me of my mother and I smiled when I read your post. People pray for healing and things in there life but they pick it back up because they don’t trust God. We need to be radical in our faith we will see mor healing and miracles in our lives and the church as a whole would start to grow. I for one know without a doubt God is going to bless you with Josiah in the perfect timing. I personally can’t wait to see his room. God is healing your body I have seen it through your posts over the last few months. I praise God for Josiah’s life and what he will do with his life. I praise God for the healing that has taken place within your body. I praise God for the lives that have been touched, blessed and changed forever through your posts and your ministry thru them. I serve a God that IS the same today. Thank you so much Sarah. Hosea 4:6 says that “My people are destroyed by a lack of knowledge..” Many do not believe (without doubt) that it is God’s will for them to healed. They think God made them sick for a reason but that is not the heart of God. I believe He wants all of His children to walk in the freedom of health. Thank you for your comment 🙂 I agree that unanswered prayers may be due to them going against God’s word but in His word (which outlines His will) is provision for healing, prosperity and fruitfulness. God’s will for our lives is not based upon what the doctors say, what your symptoms say, what your diagnosis is or what the natural circumstances dictate, but rather what His word says. There will always be times in our life when our circumstances do not line up with the Word but that doesn’t mean we should conclude it is God’s will. 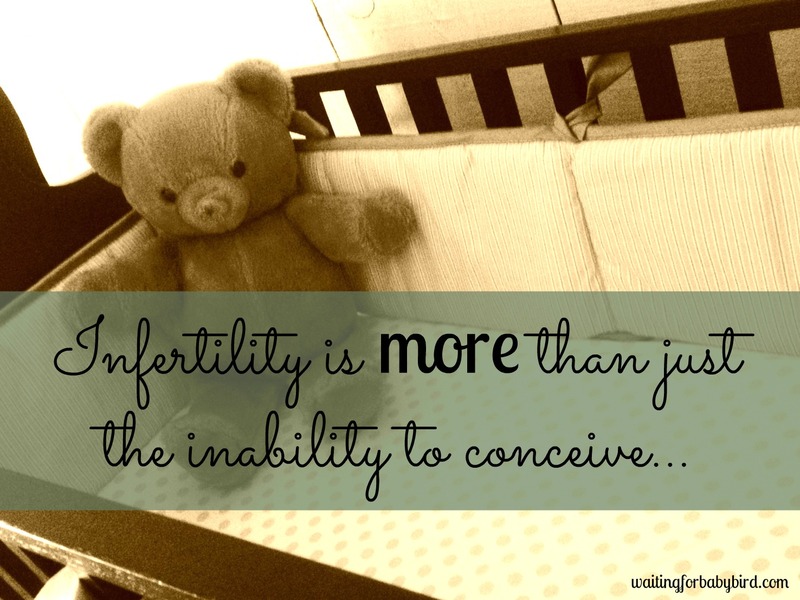 I don’t believe it is ever God’s will for someone to remain sick (which infertility is a result of sickness) when He paid such a high price to remove sickness by sending His son. In regards to Paul. Many Bible scholars say the “thorn” in his flesh was the devil continually stirring up people in every town that he went to causing him to endure intense persecution, mockery, and always being imprisoned. It wasn’t a sickness or disease. I always say that through it all, as long as I keep my eyes on Jesus then I will have His best…child or not, He is good. 🙂 I can understand that. Thank you so much for this testimony! I too knew of a lady who was trying for a child and was building her nursery. It was two years ago and I kinda thought she was a bit looney. This was before I had strong faith. I almost thought it was going to jinx her. However, she has a beautiful baby sleeping in that nursery today. I think of her often whenever I start to get cold feet. I mean what harm could be done? I lose a few hundred dollars? I am sure I have wasted more money in a month on stupider things. I dont consider my self to be a christain or spiritail person. I do find your boldness and persistant and commitment to it admirable and also encouraging. I have been very anti-prep for things. I look online and pin things on pinterest. I have only bought one materinity shirt (on clearnance). I have sturggled with the thought of putting the cart before the horse on all baby related things. For a lot of the reasons you have mentioned-fear, scared of looking like a crazy person. Just like you I also think why?? Why am I scared of looking like a crazy person–I really am a bit. I have always been that odd girl. (like pretty in pink style even made my own prom dress that was odd) Maybe as I have got a bit older I have become more pessamistic and conservative. This past weekend, I did a lot of shopping and I looked at baby things. I only shopped clearnce areas as I like deals. I didnt buy anything as nothing I really like that was gender neutral was around. I felt like I had that moment–its ok to buy something. One day I WILL NEED IT. So continue on your journey and be your self–for me its great. Its inspiring. I have been struggling with a lot of the same things. 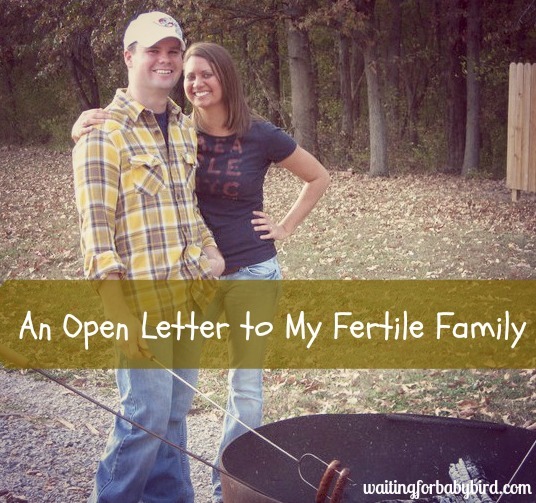 As my last IVF failed I have been far less open with my process this time. I am not sure why– broadcasting sad feelings is hard. I dont want pitty. haha I know what you mean. I will be like ‘oh I love this’ . . .of course its the most expensive one. Why cannot I not like the cheap ones?? lol. I have a hard time paying full price for anything, unless I know I will love it and/or cannot stop thinking about it. So maybe it will go on sale soon?!?!!? Awesome! Thank you.u love this post . I am going to put this out there and if you choose not to approve it, I totally understand. This has been weighing on me since I read this post. As one who fervently prayed for healing and did not receive it, I struggle with the “radical faith” idea. Not that I think you should not have that type of faith! However, if taken one step further it implicates that those of us who received a “No” as our answer from God that we simply did not have enough faith. I am a nurse who used to work in the critical care setting. I can say without doubt that God is active. I saw too many things that did not meet scientific explanation. I know God is capable to healing. I also know that the healing has to come in relation to God’s master plan. Forget seeking, asking and knocking. 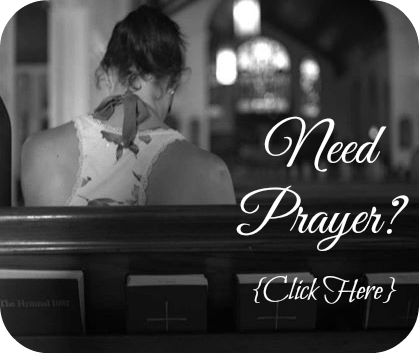 I was pounding and pleading with God for me to become pregnant. Did I believe he was capable? 110%! However, every time I was still with God and envisioned becoming pregnant, I would get a resounding feeling that it was not going to happen. Whenever I thought about adoption, I felt very positive about the outcome. I fought that for a long time not wanting to believe that God really was going to answer my prayers with a “No”. 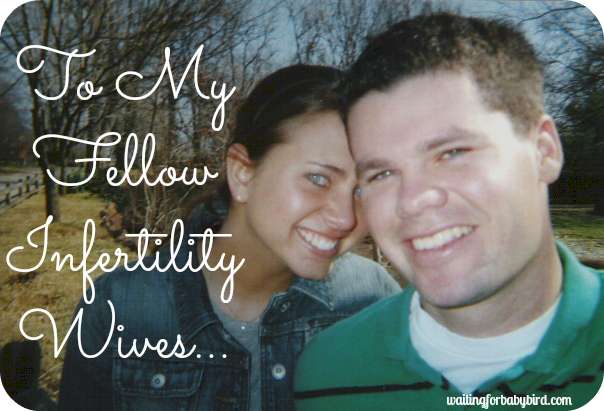 I refused to believe he would remove my fertility from me. I was only ever able to achieve peace when I finally admitted to God that I was done pleading for my will be done and that I was ready to carry out His will or my life regardless of what that looked like. For me, that meant no miraculous healing. Was my faith not radical enough? Surely, that was not the problem. The problem was that God had a different plan for my life than I did. My prayers switched from praying for my will to praying for acceptance of His will. I guess I say all of this to give caution to this line of thinking. Be radical! Absolutely! But, being radical does not always mean receiving the desires of your heart. You will receive the blessings God has planned for your life. I love your faith and willingness to live it out so publicly! Thank you! I don’t mind approving your comment 🙂 Thank you for sharing your thoughts and opinions with me. After sitting here and reading your comment multiple times I felt like you might have misunderstood my post. For me, I believe that faith not only speaks but faith acts. The words we speak express faith or doubt and faith is also expressed in our actions. Faith causes you to do something. For instance, with the woman who had the issue of blood she said, “If only I may touch his clothes I will be healed” and then she acted it out by pressing in the crowd and touching his clothes. I guess what I am saying is that I just believe that if there is something you can do to express your faith, then by all means step out and do it. 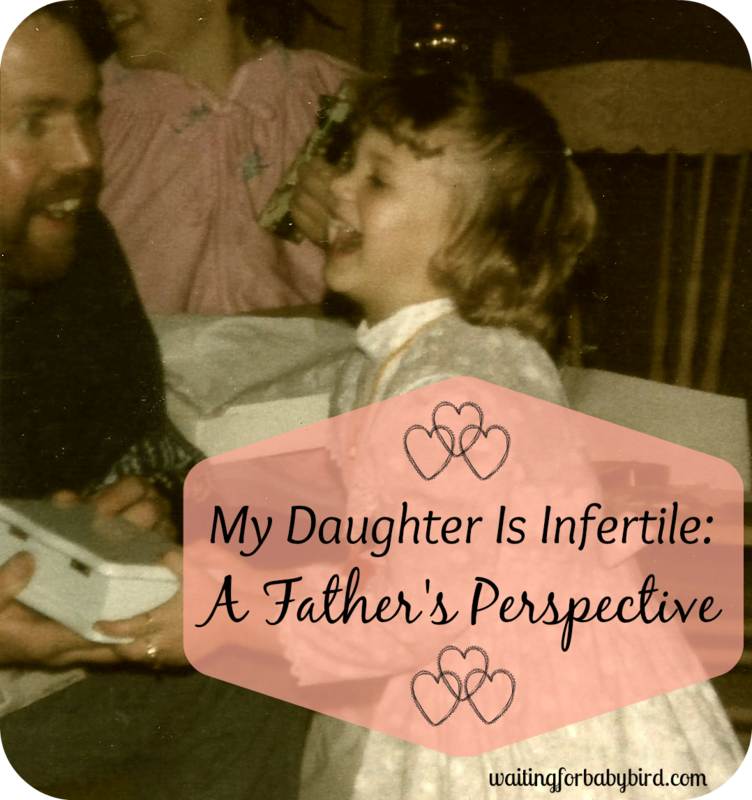 For me, I believe by faith that I am healed from anything causing my infertility and I want to act that out. I want my actions to back up my words so to speak. For some, this type of faith is seen as radical because I am believing in something I can’t prove or have evidence of right now. In regards to healing, I still believe that God desires for all of His children to be healed and made whole. What earthly father would want their children to be sick, broke or defeated? Hopefully no good father would and I don’t believe our heavenly father does either. However in your case, it sounds to me from your comment that deep down, adoption really was the desire of your heart but you just didn’t know it fully at the time. The reason I gathered this is because you said that you would have peace about it when you prayed/thought about it. Does that mean God didn’t want to heal you? I don’t think so. I just think that deep down He knew the real desire you had in your heart (which was adoption) and He wanted to give that to you. I have no idea if I am coming across right? I hope that I am but I’m not really good with having deep conversations with people in comments, texts, or emails. lol! This post had me worshipping and praising our Savior by the end of it! Thank you for sharing your heart and your faith. God IS the ultimate healer, and He desires GOOD things for His children. Thank you so much for this post, Elisha! I love how strong your faith is! I’m glad you continue to post these entries. They give me hope and determination. Amen! I will have to catch up on my blog reading tomorrow. I often think about those long 25 years Abraham waited but then I remember about how Sarah went about her own way first so maybe that’s what took her so stinkin long. YIKES! It’s my goal to not be like Sarah in that regard. LOL! I am not sure why, but I just saw these comments! Sorry, I don’t want you to think I am ignoring your thoughts! I have always taken that “By his wounds we are healed” to mean that we are healed from our sinful state, not a medical healing, given he went to the cross for the forgiveness of our sins. If I am not mistaken, it sounds as if you combine sinful nature and sickness, which is where we might diverge a bit in our beliefs regarding this subject. I agree with you that God is not the cause of the suffering, by the very nature of the attributes that you described him with, that is not possible. However, I look at the story of Job and realize that while God is not the cause of the pain and suffering, he will allow for it to exist. Not, just from a medical aspect, but a general life perspective there are several scriptures that teach us the goodness that comes from suffering. Oh I didn’t think that at all 🙂 And yes I do believe we have different views on healing which is kinda why I left the issue alone. For me when a person takes Jesus as their Savior, they get the whole salvation package. In that package are deliverance, redemption, and healing and all are activated by faith. The Greek word sozo, which is translated as “save” in the New Testament, also means deliver, redeemed, to save, heal, restore to health, rescue from danger, and keep safe and sound. Therefore I see it as Jesus takes our sin and gives us righteousness. He takes our sickness and gives us health. He takes our spiritual death and gives us eternal life. I personally do not believe that getting “saved” is just about forgiveness of sin but I think the devil wants us to think that. He knows once we accept Jesus into our hearts there is nothing he can do to stop us from going to heaven but if he can get us to not believe and putting our faith in the “whole” package then he can hinder us from at least having the fullness of life (while on earth) that Jesus died to give us. On earth, 2/3 of Jesus ministry was healing. I believe that it shows the heart of the father and that healing of our physical bodies is also important to him (not as important as spiritual healing though). One of my favorite verses is Psalm 103:2-5. It says, “Praise the Lord, O my soul, and forget not ALL His benefits-who forgives all your sins and heals all your diseases, who redeems your life from the pit and crowns you with love and compassion, who satisfies your desires with good things so that your youth is renewed like the eagle’s. If you even get a chance to read “Total Healing” by Marilyn Hickey or “You Can Be Healed” by Billy Joe Daugherty you should. I thought they were very good books on the subject of healing. I hope you have had a great weekend 🙂 It was Goldilocks birthday Saturday (she turned four) and we threw her a birthday party. It was her first ever birthday party and she didn’t even know to blow out the candle It broke my heart but I was also over joyed that I was able to experience some of her “first” moments. That is heartbreaking! My kids have no less than 3 birthday parties, sometimes 4 by the time we do my family, both sides of hubby’s family and their birthmom’s family. It’s sad to see other kids who are deprived such basic childhood experiences! You are like a breath of fresh air to discuss religious matters with even though we do not completely agree on everything! Thank you! I wish you could have been at the party because you would have left with your face hurting from smiling so much at watching her. Even a pair of socks made her squeal. It really brought things into perspective for me. I have cried all day thinking about how blessed I was to be able to do this for her. I don’t know if she will ever have another big party like this but I’m thankful to know she at least had one.